I've replaced /Library/Desktop Pictures/Sierra.jpg with a custom background image. Now, macOS Sierra applies the blur effect on my custom background image as well. I am looking for a reliable solution to turn it off e.g. overwriting a plist preference file or any non-hacking workaround? How can I completely disable the login screen background blur and show a crystal clear login image? This will replace the blurred original image with the new one unblurred. 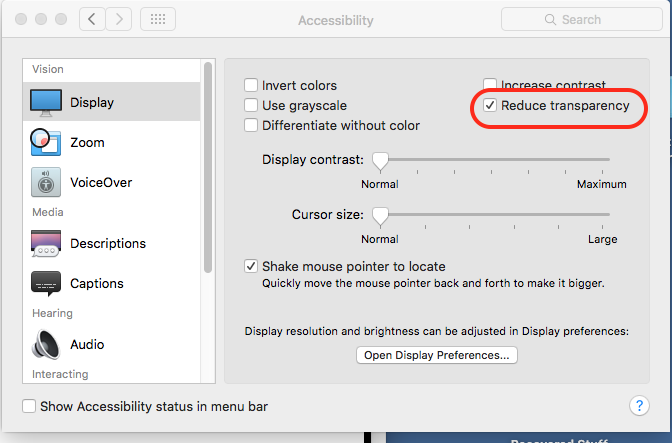 Turn on "Reduce Transparency" in Accessibility and it will remove the blur effect. This used to be called "Translucency" before, but for some reason they changed it to "Transparency". I just tested it and my blurred login screen went to a simple grey screen. The file in /System/Library/CoreServices/DefaultDesktop.jpg is an alias that points to /Library/Desktop Pictures/Sierra.jpg. so i changed the picture called "Sierra.jpg" by mine & i get this picture in login window. but it still blur effect. i do not know how to remove it !